These voyages and excavations will be costly. To fund them, you will need to gather resources from the surrounding islands and bring them back to the resource-poor island of Thera. Using landmarks to guide your way, follow your maps to unearth the forgotten temples, before time forgets them, and History forgets you. Explore the islands surrounding Thera and gather the necessary resources to fund your excavations. Only by excavating temples will you gain the fame (points) needed to achieve victory. Keep an eye on your secret Goal cards too, for they could turn the tides and bring you victory. The player with the most points at the end is the winner! Place the Thera board in the middle ot the table, making sure there is plenty ot room around it. Place the Market board within easy reach, and place all 32 Resource cubes on it, making sure that each cube covers a square ot the same color. 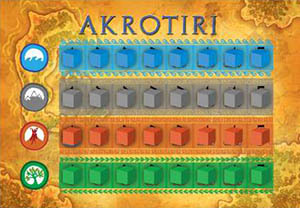 Each player chooses a color and takes the tollowing: 2 Drachmas, and, in their color, 1 boat, 6 temples, and 1 player board. Determine a first player with the method ot your choice and give them the First Player marker. 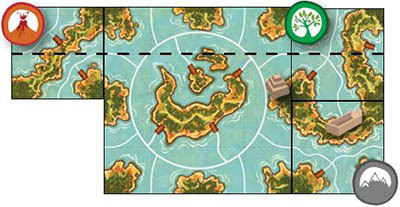 Place your temples to cover the squares at the bottom of your player board, leaving the first square (3) visible. Shuffle the Land tiles and place them as a face down pile. One at a time, starting with the first player, each player draws a tile, adds it to the board, and places 2 resources on that tile. then, place a resource of your choice on the same tile, but on a different island from the one where you placed the first cube. Shuffle each set of Map cards separately and give each player 1 Easy and 1 Medium Map card. Place the remaing Map cards in 3 face down piles off to the side: Easy (Bronze), Medium (Silver), Hard (Gold). Shuffle the Goal cards and give 2 to each player, placing the rest as a face down pile next to the Map cards. Each player keeps 1 Goal card and places the other one at the bottom of the pile. Keep your Goal card secret. 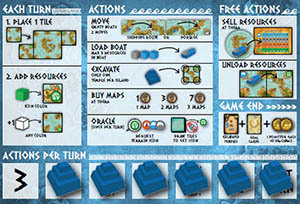 Each player places their boat on a different dock on the island of Thera. Place the remaining Land tiles face down, as a draw pile, within reach of both players. Each player draws 1 Land tile that they should keep secret. 1. Play your Land tile - add your Land tile to the map by placing it next to another tile or to the Thera board, flush against one side. New tiles must always be connected orthogonally with at least one other tile. Note: every Land tile has shipping routes on all 4 sides as well as 1 Terrain icon. 2. Place resources on the tile - immediately alter playing the tile, you must put 2 resources on it. First place 1 resource ot the same color as the tile's Terrain icon, next to this icon (if there are no cubes of that color left, then this cube is not placed). Then, you must choose a second resource (of any color) and places it on a different island on this just-placed tile. Ensure Terrain icons are not covered by the resources, since Terrain icons must remain visible at all time. In both cases, the required resources cubes are taken from the leftmost spaces on the Market board. After placing a Land tile, Oliver places the green resource next to the Tree icon, then chooses the orange resource and places it on a different island on the tile he just placed. 3. Action Phase - before playing your first action, look at the rightmost visible number on your player board: this is the number of actions you can take this turn. Unless the action says otherwise, you may do any combination of the actions listed below. Hint: use the Action tokens to keep track of your actions. The number of actions you have will increase once you start excavating Temples. Danielle has 4 actions this turn (she previously built a temple, revealing the 4). Boats move from one dock to another. They may move via Shipping Route, or via Portage. A boat may move through another boat, but it may not stop at an occupied dock. Move via Shipping Route: move your boat along a shipping route (white lines, < ). Boats may freely turn at any intersections, and they do not need to stop at docks they pass. Move via Portage: move a boat overland, from one dock to another on the same island. Empty Boat: if a boat is not carrying any resources, then it can move up to 2 times per Move action. These 2 moves must be continuous and may combine shipping route and portage; if you stop to perform a non-moving action, then that Move action ends. Moving through an occupied dock: In some cases, you will want to move via Portage through a dock occupied by another boat. Doing so costs an extra movement (either in the form of an action, or the extra move from having an empty boat). Load up to 3 resources onto your boat. Those resources can come from anywhere on the island where your boat is docked. You choose which resources to load onto your boat and do not have to load your boat to its capacity (3 resources). Dock your boat at the island where you want to excavate the temple. Play a Map card from your hand that matches a temple you can excavate. Each Map card shows the location of a temple relative to multiple Terrain icons A. Place the Map card face up on the table, oriented so the cost is at the top B. Pay that cost by returning the required drachmas to the supply. Locate the temple on the island where your boat is docked by proving that one quarter of at least one tile of this island meets all the requirements of the revealed Map card. It does not matter how far away the docked boat is from the proposed location of the temple. 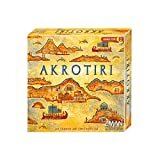 If all the requirements have been met, place the leftmost temple from your player board on your chosen excavation site. Keep the played Map card next to your board. Removing a temple from your player board reveals a bonus: either you will have more actions (starting next turn), or you get to immediately draw 2 Goal cards, keeping one and returning the other to the bottom of the deck. No temple can be excavated on the island of Thera. No temple can be excavated on an island that already has a temple on it (though future placement of tiles could connect 2 or more islands that each have a temple). Notes: each tile is divided into 4 quadrants as indicated by the dotted lines. Choose one of the 4 quadrants on one of the tiles of the island your boat is docked at as the excavation site for the temple. Each Map card is surrounded on three sides by 1, 2, or 3 Terrain icons. Starting with Terrain icons above of the pictured temple on the Map card, prove that there are at least that many Terrain icons of that type on played tiles that are located above the excavation site. 'Above a temple' means away from the direction where the player is sitting. Above also means as far to the right or as far to the left as possible, so long as it's above the excavation site. Continue proving that the excavation site is valid by showing how Terrain icons to the left, right, and below meet all the requirements of the Map card. 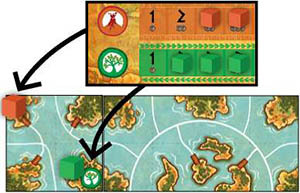 Example: Using the Map card shown above, we see a legally placed temple below: the Volcano Terrain icon on the board is above the line that is directly above the Temple (no matter how far to the left it is). The Tree icon is to the right of the temple, and the Mountain, below. With your boat at Thera, you may buy new Map cards. Each time you spend an action to Buy Map cards, you choose how many cards you buy, and for each card, its difficulty. You may have any number of Map cards in your hand. Oliver decides to spend 1 action to buy 2 cards for 3 Drachmas. Later during the game, having some actions to spare, he decides to spend 3 actions to buy 3 cards, also for a total of 3 Drachmas (in this second case, he uses each action to buy exactly 1 card for 1 Drachma). Once per turn, you may request to draw a tile with a specific Terrain icon. Simply say out loud which icon you wish to have and flip Land tiles, one at a time, until you reveal one that shows the requested icon. Keep the Land tile with the requested Terrain icon and put all other revealed tiles in a discard pile. If you do not find a Land tile with the requested Terrain icon, keep the last revealed tile instead. You can only ever have one Land tile in your hand at a time. The following actions are free actions. They may be done any number of times and do not cost any actions. When your boat is docked at Thera, you may sell your loaded resources. 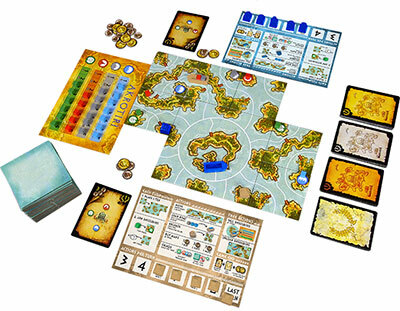 One at a time, place each sold resource on the rightmost available space of that color on the Market board and take the corresponding amount of Drachmas from the bank. Danielle is selling 2 Blue and 1 Gray resources this turn. She places those cubes on the circled spaces and takes (3+3+2) 8 Drachmas from the bank. You may unload as many resources onto an island as you wish. Take the resources off the boat and place them on the island where your boat is docked. After resolving your actions, draw a tile (unless you drew one using the Consult the Oracle action). Regardless of where your tile came from, play then passes to the other player. If the Land tile deck runs out at the end of a turn, shuffle the discarded pile to form a new pile of Land tiles. Once a player has excavated their 6th temple, the game is nearing its end. Finish the round so that all players have played an equal number ot turns (i.e., the non-first player will be last to play), and then proceed to the final scoring. The player who scores the most points is the winner. 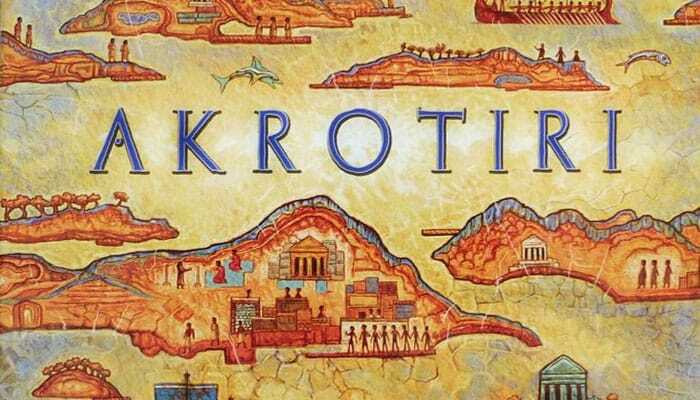 Each player scores points tor the following 3 elements: Map cards, Goal cards, and Drachmas. +Map cards: Add the points tor each ot your played Map cards cards (the point-value is shown in the top right corner of each Map card). These correspond to your excavated temples. Map cards still in your hands are not worth any points. Goal cards: Reveal your Goal cards and add any points tor achieving them. Your temples count only once per Goal card, but can count tor each ot your Goal cards. See page 8 tor more information. Drachmas: Finally, score 1 point for every 10 Drachmas you have left. Ties are broken in favor of the player with the most Drachmas. If there is still a tie, then players rejoice in their shared victory. Step 10: Place 5 Goal cards lace up next to the pile. Whenever a player builds their 3ld and 5th temple, that player chooses 1 Goal card among the remaining lace up cards. This replaces the Draw 2, keep 1 depicted on the player boards. These Goal cards are never refilled.